This easy slow cooker mushroom pesto lasagna is a one pot meal that is perfect for your meatless Monday. No need to pre-boil the noodles, everything cooks right inside your slow cooker for an easy, hands-off supper. Have you guys seen these new casserole crockpots? They are pretty sweet. They have an insert that’s like a 9×13 pan. It’s perfect for lasagna, casseroles and desserts (like apple crisp)! The cool thing about it is that the insert is oven-safe. So, if needs be, you can bake your meal in the oven and then just keep it warm in the crock. This would be perfect for potluck parties. Or, conversely, you can cook your food in the crockpot and then brown up the top or melt cheese in the oven. Hooray! I’m so excited about it. 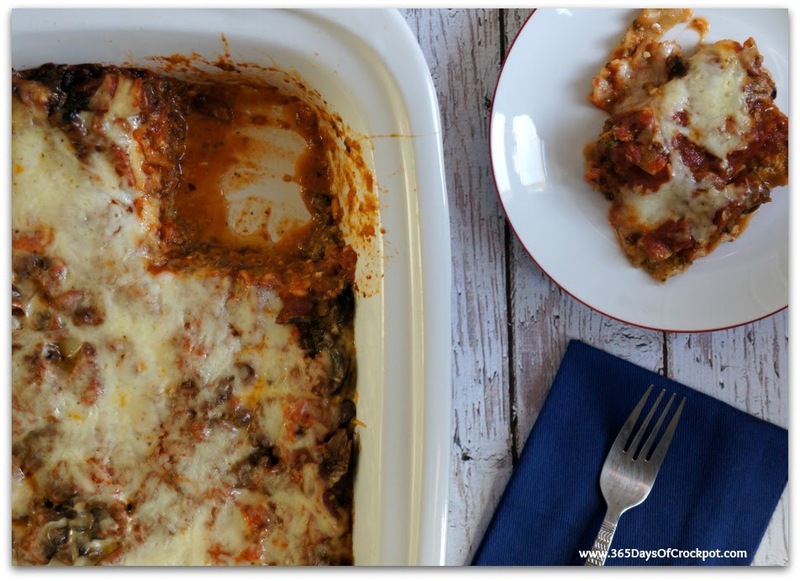 I decided to break in my new casserole crock by making a delicious meatless lasagna that was loaded up with pesto and mushrooms (2 of my favorite foods). 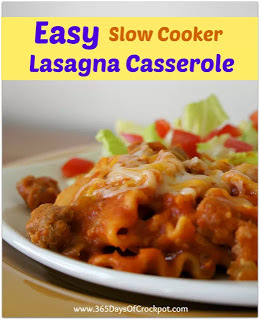 Whenever I make lasagna in the slow cooker I always use whole wheat lasagna noodles. They are healthier and hold up much better than plain, white noodles. The best thing about slow cooker lasagna is that you don’t need to pre-cook the noodles. They get perfectly done with all the moisture inside the slow cooker. I used cottage cheese in my version of this dish, but if you prefer ricotta then you can easily substitute that. In addition, I used a tomato-based pasta sauce but I think using an alfredo sauce would be amazing with the pesto and mushrooms. of the pasta sauce on the bottom. Top with 3 lasagna noodles. sauce, cottage cheese and the egg. cheese/pesto mixture over the top of the noodles. and 2/3 cup mozzarella cheese on top. hours or on LOW for 5-6 hours. 9. Cut into squares and serve! P.S. 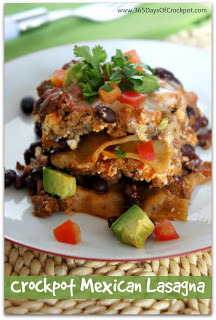 Try these other great crockpot lasagna recipes as well! Lasagna is the easiest and most delish comfort ever in my recipe books!! I rarely use tomato-based recipes anymore and stick to alfredo sauces. My favourite lasagna for company is thick-sliced bacon, spinach and mushroom with Classico original alfredo sauce in the 410mL jar (diluted with skim milk or water). Substitute the bacon with chicken and either way you'll be queen/king of the kitchen. Geri that sounds absolutely delicious!!! Can you fix this in a regular crock pot just the same as the casserole shaped ones? 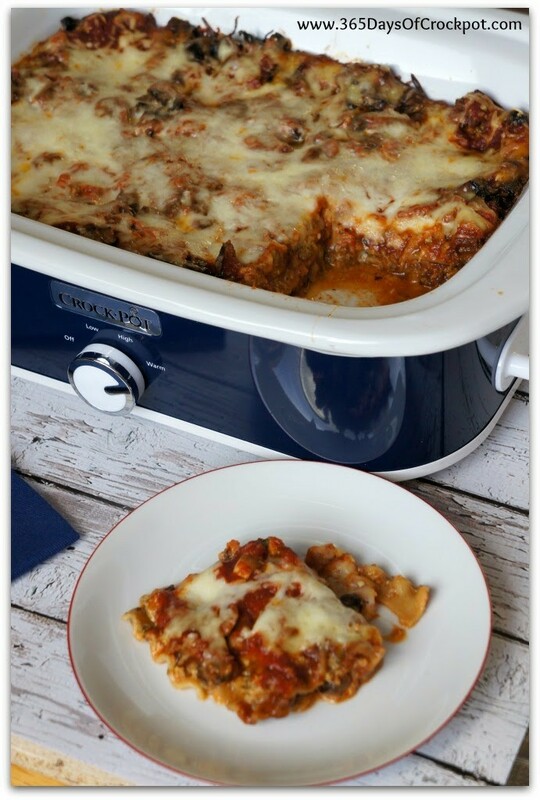 Yes, I make lasagna all the time in my 6 quart oval slow cooker! You may have to break up the noodles a little bit to fit.